Faience is a French term that refers to tin-glazed earthenware. The term comes from wares produced in the Italian town of Faenza and exported from there. It is the same type of glaze decorating is seen in majolica and delft pottery. Faience was traditionally red earthenware covered with an opaque white lead-based glaze (a high tin content gave the glaze opacity and whiteness). The base glaze was then decorated with brightly colored glazes painted over it. 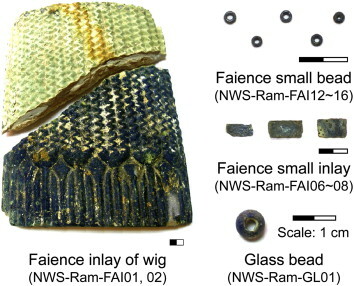 Archaeologists working in Egypt in the early 20th century mistakenly called items made with a self-glazing ceramic body (properly know as Egyptian paste) "faience". To many people's confusion, the term "faience" is still used for both tin-glazed ware done in the 15th century Spanish tradition and Egyptian paste ware created in ancient Egypt. Because of this confusion, it is generally better to avoid using "faience" as a term at all. It is better to refer to tin-glazed ware as majolica and the ancient self-glazing ceramic bodies as Egyptian paste. "Faience" as a term was derived from the name of a town known for its brightly decorated tin-glazed ware: Faenza, Italy.Egyptian paste (also known as Egyptian faience) is a self-glazing ceramic body. In other words, the glaze materials are included in the clay body. No further glaze will be needed for the Egyptian paste piece to fire with a glossy glaze surface. 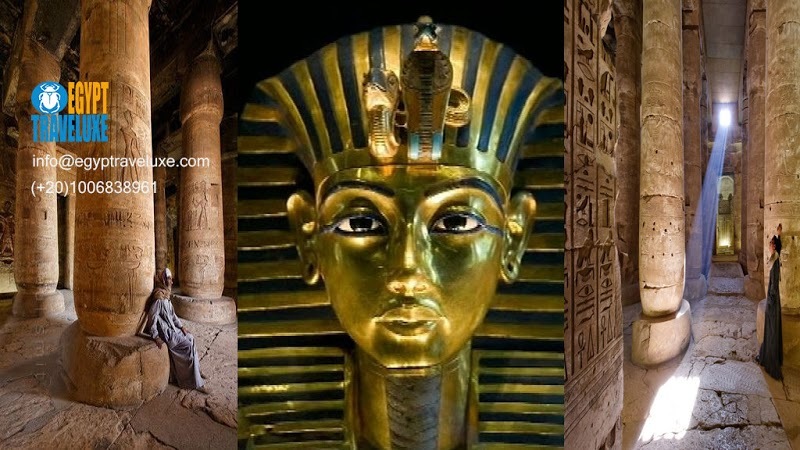 Egyptian paste was first developed in the area surrounding the Nile River in northern Africa. Although unglazed pottery had been made here and in many other places in the world, Egyptian paste was the first pottery to have a glaze, rather than being left plain or painted with non-glaze pigments. The discovery may have occurred when potters observed high sodium-bearing rocks fusing in their firing pits. 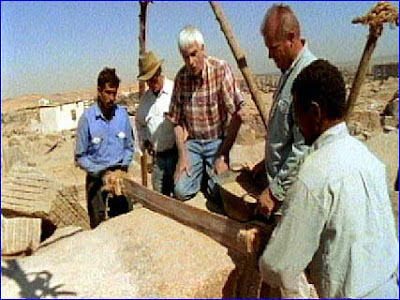 Another possibility is that soda ash from the desert had gotten mixed in with the desert clays and talc that the Egyptian potters were using. In any event, Egyptian paste was in use before 5,000 BCE. From that time through to Roman occupation of Egypt, Egyptian paste was used extensively. Main products were beads, charms, and special objects. Egyptian paste is a ceramic body (called that because it may or may not contain any actual clay) that includes soluble sodium carbonate. As the paste dries, the sodium carbonate migrates through the body to the surface of the piece, pulled by the action of water moving out of the piece as it dries. Colorants that are included in the paste are pulled along with the soluble sodium carbonate. Although different colors were used, the most common colorant was copper. The copper and sodium work together to produce a strong, lovely turquoise blue. Even though copper is the most recognized Egyptian paste colorant, other colorants can be used. Egyptian paste is very non-plastic; it is stiff and sticky if too much water is added. 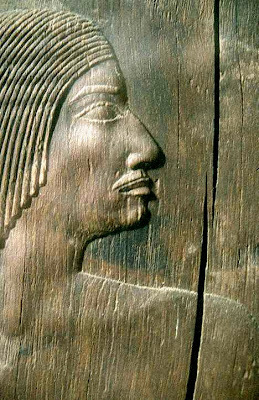 Although all hand building techniques can be used, Egyptian paste works best when formed or carved into simple shapes. It is well suited for use with press molds, as well. During drying, pieces should be left untouched. This is because the glaze materials rise to the surface, becoming a very fragile, almost furry-looking, coating. The slower a piece dries, the longer the sodium has to get to the surface. Therefore, slow drying helps achieve the best glaze coating possible. Egyptian paste is a low-fire body and should generally be fired between 1562° and 1742°F (850°C - 950°C). It is not bisqued first, since the glazing materials are already on the piece. Egyptian paste recipes very somewhat. Generally, about 60% of the body will be non-plastic material; there will be at least 10% of a sodium-bearing material such as soda ash, bicarbonate of soda, or borax; and there may be up to 20% clay. Numerous Ramesside cobalt-blue glasses and faiences were found in Memphite sites. We analyzed these Ramesside cobalt-blue artifacts using a portable XRF spectrometer. 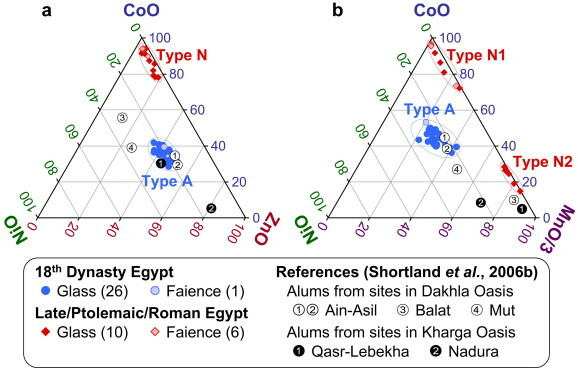 We found that newly discovered source of cobalt colorant was used in Ramesside Egypt. 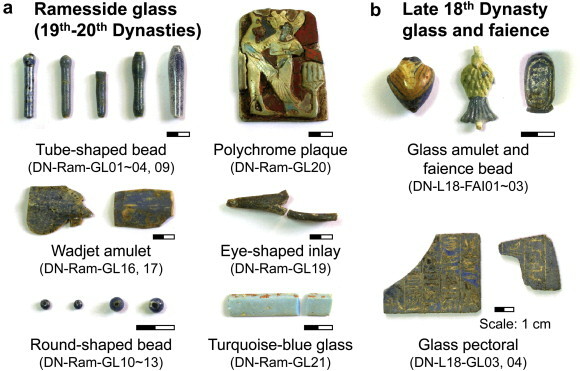 The Ramesside colorant was different from the colorant used during the 18th Dynasty.